Saints and Scripture Sunday: Heading into Lent - The Kennedy Adventures! Ash Wednesday is knocking at the door, and I’ve been doing a lot of thinking about this year’s Lenten season. For Catholics, the Lenten season reminds us of our baptismal commitment. On Ash Wednesday, as we are marked with ashes, the priest or deacon reminds us of our mortality and dependence on God’s mercy. Our three pillars of Lenten observance are prayer, fasting, and almsgiving. For this Lent, I’m going to focus my efforts based on these tenets. 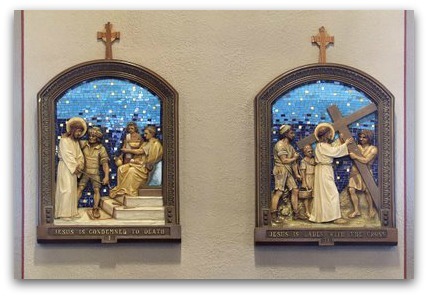 One of our most beautiful traditions is the Stations of the Cross. These series of prayers, marking the Passion of Our Lord can be said any time of the year, but people feel especially drawn to them during Lent. This coming Friday, I’ll be taking the Kennedy Kaboodle for Stations of the Cross. Rachel’s American Heritage Girls troop is participating in a service project and providing a pasta dinner for our sponsoring parish. I may not be able to make it through all 14 Stations, but I plan to try. During the Lenten season, we participate in fasting, as well as abstinence. On Ash Wednesday and Good Friday, our fast consists of one FULL meal, avoiding meat. On all Fridays during Lent, we abstain from eating meat. As part of our abstinence this season, many people choose to ‘give something up’ during Lent. Giving something up requires a sacrifice, and reminds us of God’s sacrifices for us. I always try to curb my potty mouth during Lent, and usually fail miserably. It’s not ladylike, and it’s certainly not a habit I want my children picking up. This year, I’m trying to tackle that demon again. I’m even going to tie it into a ‘cuss jar’ – where I drop money for my transgressions. With almsgiving, we are reminded of our calling to help those less fortunate than ourselves. I recently took over a parish council position as Social Ministry Chairperson at my church, and I’m amazed at all the different ways we can assist others. Since we’re busy saving up money for Baby #5 and paying off bills, the majority of my almsgiving will be with the gift of time. By making my list public and having you follow along, I’m making myself more accountable this Lenten season. What about you? What are you planning to do this Lenten season to grow in your faith? Looking for more faith filled link ups? I'll be sharing my stories at:Scripture and a Snapshot, Sunday Snippets, Spiritual Sundays, Hear it on Sunday, Playdates with God,Titus 2sday,On Your Heart Tuesday,Domestically Divine Tuesdays,Gratituesday,Word Filled Wednesdays, Walk With Him Wednesdays, iFellowship, Planting Mustard Seeds, Good Morning Girls,and Journeys of Faith Fridays. You have some wonderful resolutions set up for Lent! I don’t have my plan solidified yet, but participating in the Stations is high on my list this year. I have to keep them simple, and concise, or I’ll never make it through!! We managed to get to Vespers AND Stations on Friday. Of course, my crazy boys were all over the place, but at least we were there, right? I should also try to give up the profanity. After 6 years in the Army, I’ve gotten really bad about it. I’m not sure what else I’ll try to give up. I’m planning on Stations of the Cross and finally getting around to a lot of Christian reading that I’ve been putting off though. Well .. it’s not going off without a hitch. There’s $10 in the cuss jar already, and we’re not even a week in. Argh. On a positive note, I rounded up the littles and my husband for Vespers and Stations of the Cross last night. The boys were crazy, but I enjoyed being able to at least listen. It was beautiful. Great plan for Lent. I found you through Sunday Snippets. Beautiful blog. Thank you, Colleen! We’ll be here every Sunday! For Lent, we have an optional program of daily exercises to help assess our personal orientation in the spiritual life, understand the major stumbling blocks in our path and take actions designed to turn them us into men after God’s own heart. So my goal is to complete this program. Thanks for asking about Lenten goals! I think it’s a great time to transform our lives. my parish does That Man Is You but unfortunately I’m not a man so I can’t partake. Although I doubt I would b/c they meet at 6AM!! No way I’m getting up that early! Paradisus Dei seems to be developing more programs, based on the success of That Man Is You. There’s a family program and (under development), one for college men a women. Is your parish (or one close by) doing Why Catholic? I led a small group last spring, and I really enjoyed it. I’m a major bulletin shopper – in other words, I look at all the things going on in the surrounding churches, and if something catches my eye, I’m in! That’s awesome! I’m strongly encouraging my husband to attend a local Catholic Men’s Conference this spring, and he told me he plans to join the Knights of Columbus soon, too. Hooray! Lent is most often celebrated by Catholics, but there’s quite a few Protestant circles that have followed suit as well. I think it’s applicable to all Christians – we’re preparing our hearts and minds for Easter. I found you through RAnn’s Sunday Snippets too and came over to say hello. Stations of the Cross is a must for us during Lent but I’ve also been doing it year round on Fridays after our rosary group. Our group stays after daily mass to pray the rosary and those who’d like to stay, join us for stations. Thanks for coming by, Noreen! I’m loving all the new faces I’m seeing this week! We managed to make it to Vespers and Stations this week, as my daughter’s American Heritage Girls troop was hosting a pasta dinner for the parish. I even have an app for my iPad for Stations, but found out last night that mine is a more contemporary version, where the one at the parish last night was the traditional version. I’ve got to check my own church, and see which version we use, and print out the prayers. I just listened last night (my husband had the booklet, and I was on ‘keep the boys contained’), and was amazed at how beautiful it was. I’ve only been one other time, and that was on Good Friday, when my youngest daughter was a few days old. There’s a parish here that does the Stations in an outdoor garden of sorts, and it’s beautiful — really walking the Way of the Cross. For me Lent has always been a time to improve. I try very hard to do something I know will make me healthier: spiritually, emotionally, physically. It must be a RAnn homecoming, because that is where i found your blog as well. I love the idea of these linkys, what a great way to meet new blogging Catholic women/moms! I know! I need to send RAnn a big thank you for sending all these folks over! Thanks so much for stopping by! Great to meet you! HEHEEHEH that is physical enough!!!!! I want to get to adoration once a week during Lent. If I do that along with fasting and abstaining and a little extra almsgiving it will be really big for me. I’ve never managed to stay an hour with Adoration, and that’s my goal this spring. I plan to say the Rosary, and Divine Mercy Chaplet, then bring some books I’m working on to read as well. Let’s cheer each other on! This year I decided instead of just giving up something that I want to do things like, give, help, fast and pray, random and un-random acts of kindness. Have a wonderful day! I came to that realization a few years ago, too — to improve myself spiritually, not just avoiding caffeine, etc. It’s easier to get my children involved that way, too! Good luck, and thanks for coming by!! I think there is a lot to be said for observing Lent. As a protestant, it was never an issue in churches I’ve been associated with. As for the potty mouth thing, if I had ever said anything like that when I was a kid my mother would have been appalled. I never wanted to make my mother sad. I did grow up in a different era though. I’m appalled at how kids and teens talk today. They probably learn it at home, from other kids, from movies and TV. Seems like it’s everywhere. Good for you to try to overcome it. Thank you for sharing on Spiritual Sundays. The cuss jar has $10 in it all ready. On a better note, no money has been from today! Hooray! Thanks for stopping by, Denise! As an Episcopalian, we observe Lent in many of the same ways as you do. This year, I’ve given up desserts and I’m focusing on how to cultivate those things in life that I feel God has really impressed upon my heart — weeding out busyness, distractions, etc. Can’t wait to follow up on your progress when you come back to SDG! Oh, these are so good! (cultivating the things in your life!) I often wonder how life was different back in pioneer times … with less distractions, etc. I’ll definitely be back to SDG! 🙂 Thanks for coming by! I plan to read a parable a day and reflect on it. Praying it will bring me closer to Jesus. I’m seeing so many good ideas here! I’m filing these away! Thanks for stopping by, Maribeth! Oh, boy, I need it! It truly is such a bad habit, and I find myself cursing in the course of general conversation — not even when I’m angry. YUCK!! You have very well-defined goals for your Lenten season, and that means you’ll be more likely to accomplish them because you know what you’re focusing on! I didn’t grow up observing Lent, but my husband did. I love the reasoning behind it and the self-examination and sacrifice in preparation for Easter. We’ve observed it together since we got married. Great to see you again, Jennifer!